Item #CG-10558: 10x19mm triangle Chrysoprase Cab of 6.78 Cts. $20.00/Ct. Item #CG-10557: 10x14mm rectangle Chrysoprase Cab of 7.24 Cts. $20.00/Ct. Item #CG-10535: 10x17mm trapezoid Chrysoprase Cab of 7.32 Cts. $20.00/Ct. Item #CG-10537: These Cushion Chrysoprase Cabs are avilable in two sizes. Please choose your size below. $20.00/Ct. 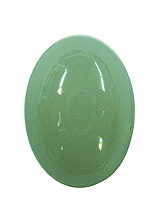 Item #CG-10539: Our Oval Chrysoprase Cabs are available in several sizes at different prices. Please choose your size below. $20.00/Ct. Item #CG-10538: These Round Chrysoprase Cabs are available in two sizes at very limited quantities. Please choose your size below. $20.00/Ct.